Hey, it’s Fred in his first movie! And he is in love with the girl next door, Judy. But his nemesis neighbor Kevin, thwarts all attempts Fred makes to see her, and when he finally succeeds in making it over to Judy’s house – she’s moved! With the advice of his super cool dad - John Cena, Fred embarks on an epic journey full of gut-busting fun to find her. So, jump in the kiddie pool and join Fred, Bertha, and the whole gang for a hilariously good time in Fred: The Movie,, available on DVD October 5th, 2010! Watch this exclusive clip with a Shout Out from Fred! 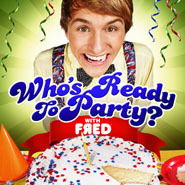 Internet teen sensation, Lucas Cruikshank -Fred released his second CD "Who's Ready to Party?" on September 21st, 2010! Lucas Cuikshank (aka. Fred Figglehorn) who stars in his wildly popular YouTube series, “Fred” will release his second album, “Who’s Ready to Party?” on September 21, 2010. With an astounding 580 million video views, Fred is thrilling his fans with four music videos that will premiere on his YouTube channel, and two singles – “Don’t Forget to Brush” and “Who’s Ready to Party?” available through iTunes. Watch his music video "Don't Forget To Brush"
Although the album will be available to download through both Amazon and iTunes, super fans will be able to buy the CD and other exciting Fred Party Pack items directly from www.fredfigglehorn.com. The Ultimate Fred Party Pack includes a “Who’s Ready to Party ?” limited edition t-shirt, signed poster, CD, and album/music videos downloads. Only available to 20 lucky fans, this pack also includes a personal phone call from Lucas and will feature the fan’s webcam video in an official Fred YouTube video. Cruikshank’s phenomenal YouTube success has ignited a Hollywood career. Having won a Teen Choice Award for Favorite Online Celebrity, he has also made appearances on hit teen television shows, “iCarly” and [kwlink 22504.“Hannah Montana”[/kwlink]. Fred: The Movie, starring Cruickshank, premiered on Nickelodeon on September 18th in conjunction with his album release on September 21st. What Kind Of Movie Star Would U Wanna Be?